I only know one js library and that is jQuery. But my other coders in the group are changing AngularJS as their default library in new project. I don't know anything about it. How is it different from jQuery? I already have a set of functions done for similar tasks in jQuery. Can I still use jQuery stuff with AngularJS? This opens a door for server rendering that can address SEO issue and work with Nativescript etc that don't work on browsers. If you want to watch more tutorial video, check out this post, Collection of best 60+ AngularJS tutorials. You can use jQuery with AngularJS without any issue. In fact, AngularJS uses jQuery lite in it, which is a great tool. Yes, Angular can use jQuery if it's present in your app when the application is being bootstrapped. If jQuery is not present in your script path, Angular falls back to its own implementation of the subset of jQuery that we call jQLite. However, don't try to use jQuery to modify the DOM in AngularJS controllers, do it in your directives. I want to add something regarding AngularJS difference with jQuery from a developer's perspective. In AngularJS you have to have a very structured view and approach on what you want to accomplish. It is scarcely following a linear fashion to complete a task, but rather, the exchanges between various objects take care of the requests and actions, which, then, is necessary as angular is an MVC-Based framework. It also requires an at least general blueprint of the finalized application, since coding depends much on how you want the interactions to be completed. jQuery is like a free poetry, you write lines and keep some relations and momentum appropriate for your task to be accomplished. Though, in Angular JS, you should follow some rules as well as keeping the momentum and relations proper, maybe it is more like classical Spencerian sonnet (a famous classical poet) whose poem is structural and tied to many rules. Compared against AngularJS, jQuery is more like a collection of codes and functions (which is, as already mentioned, great for DOM manipulation and fast-effect achievement), while AngularJS is a real framework which gives the developer the ability to build an enterprise web-application with a lot of data-binding and exchange within a superbly organized-routing and management. 2- Angular JS is fully independent to handle directives and structure your app; you might then simply claim that jQuery can do the same (independence), but, indeed, AngularJS, as several times mentioned within the above lines, has independence in the most excellent possible structurally MVC-Based way. A last note is that, there is no war of Names, since it is far disturbing to be biased, or subjective. jQuery's magnitude and greatness has been proved, but their usages and limitations( of any framework or software) are the concerns of the discussion and similar debates around. Using AngularJS is decisive as it is expensive in terms of implementation, but founds a strong base for future expansion, transformation and maintenance of the application. AngularJS is for the New World of Web. It is targeted toward building applications which are characterized by their least resource consumption (loading only necessary resources from the server), fast response time and high degree of maintainability and extendability wrapped around a structured system. AngularJS : AngularJS is for developing heavy web applications. AngularJS can use jQuery if it’s present in the web-app when the application is being bootstrapped. If it's not present in the script path, then AngularJS falls back to its own implementation of the subset of jQuery. I think this is a very good chart describing the differences in short. A quick glance at it shows most of the differences. One thing I would like to add is that, AngularJS can be made to follow the MVVM design pattern while jQuery does not follow any of the standard Object Oriented patterns. They work at different levels. With jQuery you do dom-manipulations, with Angular.Js you create whole web-applications. jQuery was built to abstract away the various browser idiosyncracies, and work with the DOM without having to add IE6 checks and so on. Over time, it developed a nice, robust API which allowed us to do a lot of things, but at its core, it is meant for dealing with the DOM, finding elements, changing UI, and so on. Think of it as working directly with nuts and bolts. Angular.Js was built as a layer on top of jQuery, to add MVC concepts to front end engineering. Instead of giving you APIs to work with DOM, Angular.Js gives you data-binding, templating, custom components (similar to jQuery UI, but declarative instead of triggering through JS) and a whole lot more. Think of it as working at a higher level, with components that you can hook together, instead of directly at the nuts and bolts level. Additionally, Angular.Js gives you structures and concepts that apply to various projects, like Controllers, Services, and Directives. jQuery itself can be used in multiple (gazillion) ways to do the same thing. Thankfully, that is way less with Angular.Js, which makes it easier to get into and out of projects. It offers a sane way for multiple people to contribute to the same project, without having to relearn a system from scratch. 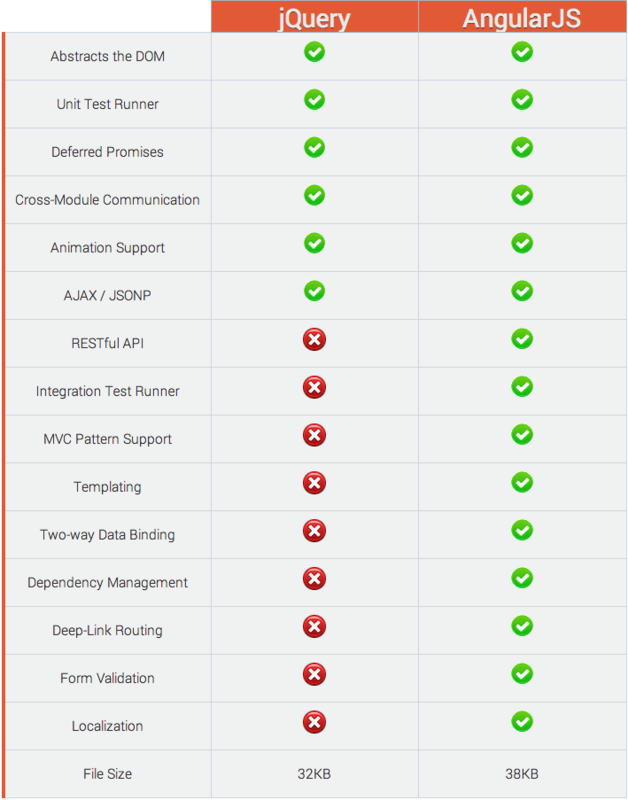 What are the key differences between jQuery and AngularJS? What is the difference between jQuery and AngularJS? is a great tool for building highly rich client-side web applications. are designed to work together in a truly interconnected way). 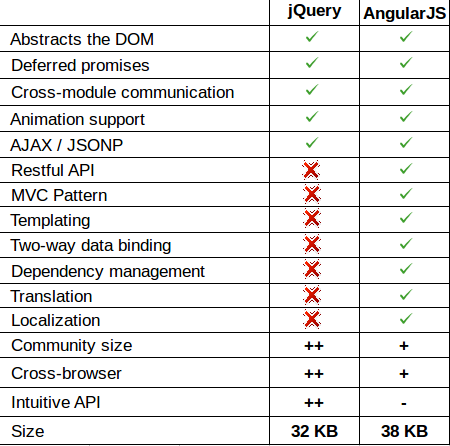 What does jQuery do better than AngularJS?